I have had my front crankshaft seal replaced four times in the past year and a half. I've had family and mechanic shops replace it. Each time, it holds up for a little bit then starts leaking again. The most recent time it was replaced was about three months ago, and I also had to replace my alternator because oil got thrown up into it. It's now starting to leak again. The last seal I got was from the dealership, so I'm not sure why the thing keeps leaking. Please help! 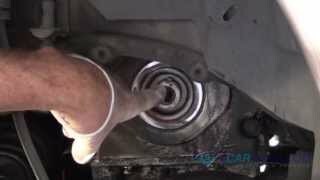 The reason they leak is from the crankshaft itself. It is wobbling up and down. This happens because the front main bearing is most likely worn allowing the crank to wobble. If you have had three replaced, I would have someone check this bearing to confirm. I have included a oil leak flowchart for you down below in the diagrams. Let us know what you find out please. I hope this helps. Roy - I wasn't aware of any bearing, but I'll definitely ask my go-to mechanic to check that out for me. Alex - Is that something they would have noticed when they were replacing it? Like Roy said, it is the crankshaft itself that is causing this. They should been checking for what was causing this especially since this is the third one in a year and a half. Without seeing it we can only make educated guesses as to what is wrong with the crankshaft, but we know that it is the crankshaft. Thank you for the information. I'll see what I can find out about it and get back with you guys. Hello my name is Dave. It appears to me that the most likely problem is with the harmonic balancer, if you could have your mechanic check it to make sure that the isolation rubber is in good shape if it is it most likely has a small groove in it from the original bad seal. There are usually two options to repair this issue, first would be a repairing seal which is offset so the seal rides in a different position on the balancer, the second would be a repair seal which is a very thin metal sleeve that goes over the balancer giving it a new surface to seal to.